N2O (AKA N2O: Nitrous Oxide) is a Tempest-esk styled shmup (shoot 'em up) that has you playing as a lone space pilot that's on a mission to save the universe. What is he/she/other (could be a robot or an alien) saving the universe from? Well, the pilot is trying to save the universe from a giant alien that is filled with a legion of killer space bugs. The way the pilot must save the universe is by flying inside of the giant alien, blow it up from the inside and wipe out any space bug that they see. Does humanity even stand a chance? Well, that'll depend on your skills but the real question is that is this game any good? (Click on "Read More" to read the full review). 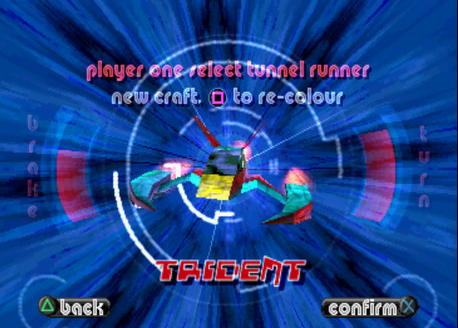 Gameplay in this game has you blasting at enemies while travelling down tubed shaped levels, where you can only move in a circle due to being stuck on the walls, like the classic arcade game, Tempest (1981). 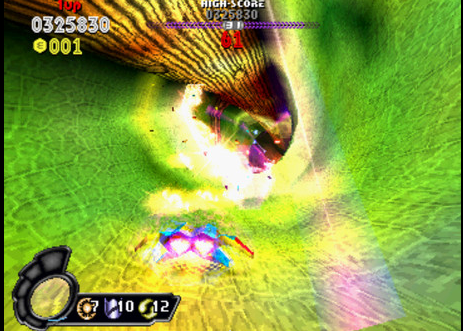 Unlike the game, Tempest, this game plays at an ultra-fast pace and this adds a real intense nature to it and you'll want to blow up the enemy before you crash into it. The game will start at a dealable pace but the speed will increase greatly as you go along. The levels in this game will warp into more awkward designs, and the enemies will grow in quantity and strength, so you'll really need to be careful on how you'll play for if you want to survive and save the galaxy. The enemies will also grow stronger if you fail to kill them right away. Gameplay is very fun and addicting to where you'll find yourself playing this game over and over again due to the simple but brilliant arcade styled gameplay. The way you progress though the levels is by blowing up a certain amount of enemies, once you've done that, the exit gate will open and you can then move on deeper into the belly of the beast. Some levels will have boss fights and the bosses are just larger versions of the standard enemy, they are also tougher too. Sadly, you only start off with a little laser beam but you will find and earn more power-ups that include: Shields, screen clearing bombs, and more powerful guns. Defeating enemies will force them to drop coins, these coins will come in many colors and each color coin is also worth a specific amount of currency. Upon beating a level you can choose to spend the coins on bombs or you can bank them for points for if you're going for the top score. Other power-ups can be found just by playing through the stages and these power-ups come in handy, so don't waste them. Speaking of levels, you have a level select screen but you can only select a certain amount of levels on this screen and not every level. You can jump to any level you want but it'll require you to input a password but you can also use this to input cheat codes for some extra fun, especially for if you want to see the entire game but lack the skills to do so. There are also bonus levels you can get to and in these bonus levels you'll have to fly around and avoid spikes. The spikes can be destroyed with bombs and you can earn some really sweet extra points from doing so. You'll also be able to pick from a small selection of ships, each with their own designs and abilities, you can customize the color on them and I like that a lot. Using the cheat codes will also unlock the ability to use the best ships in the game and they were fun to play as. Controls in this are very smooth and very simple as all you have to do is move and shoot, move and shoot, repeat, but setting up the controls is a tedious process. This game automatically sets the controls to a PC keyboard which is fine for if you're playing this on a PC. If you are playing on a laptop or with a USB controller then you'll have to go into controller configuration to set your controls every time before you boot-up the game, it's very annoying that it doesn't save your settings. Another thing about this game is that it's a straight up port of a playstation game and this will make you feel a little weird as you'll see the playstation button symbols, the playstation memory cards will also appear, and even the old anti-piracy screen from early playstation games pop-up. All of this does make this release of the game look a little shady and make you feel like you are playing an illegal rom despite it passing though Steam's release system. Seeing as this is an old playstation game, the graphics are quite dated to where younger players will not be interested in this game one bit. For us old guys that grew up on these games, you will feel very warm on the inside with the retro 3D look of the game. The one thing I dislike about the graphics is that the high speed makes all of the level graphics blend in together and making it hard to make out where I'm going. Character designs are very generic but is partly saved with the ability to customize your ship to be what ever color you want it to be. I didn't care for the designs of the aliens as they just looked liked common insects and that made them a bit bland and boring. The designs for the levels start off looking very cool and really fit the sci-fi theme that it was going for, however, once you've reached a certain point in the game you'll notice that the level designs become quite random and unfitting. The weirdest level I saw was when it turned into a football (soccer) theme and it wasn't just weird, it was also very goofy. The animation is pretty good and has aged well due to its smoothness. Soundtrack in this game was done by a techno band called The Crystal Method, yes, that Crystal Method. With that said, the soundtrack in this game is awesome with its cool sounding electronic sounds that work really well with the game and the soundtrack just sounds awesome in general. 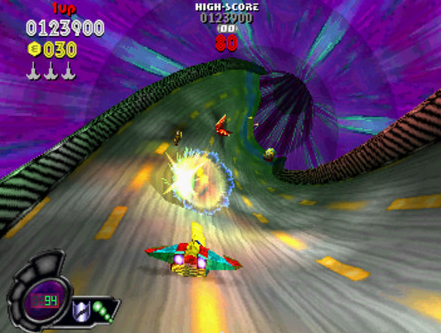 The soundtrack and gameplay also enhances the game's sound effects due to the intense futuristic atmosphere and makes you feel like a DJ mixing in some of your own samples in a live remix track. 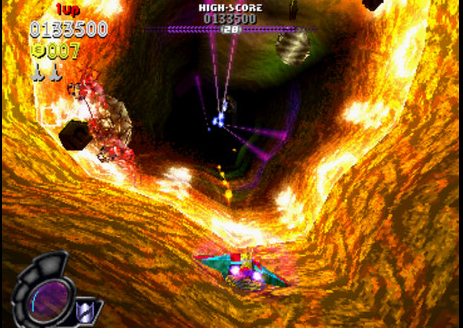 Overall, this game has aged a bit but that doesn't mean that this game isn't fun as it is a very fun Tempest like shooter that'll have you reaching for the high score. I do recommend giving this game a go for if you're a fan of retro gaming. Simple but fun.